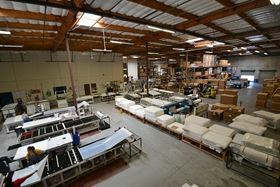 Synder Filtration HQ Manufacturing Facility in Vacaville, CA, USA. The 1970s were the glory days of American manufacturing. Back then, American manufacturing was the bedrock of the American economy. Unfortunately, factory jobs have been on a steady decline ever since. It's easy to blame China, Republicans, or Democrats for the drop in American manufacturing. In reality, it was the robots that took our factory jobs. US manufacturing output is at an all-time high, but factory jobs have dropped from 19.5 million workers in the 1970's to 11.5 million workers in 2009 (St. Luis Fred). Our factories are more efficient, and they need fewer workers. Jobs once done by human hands are now done by robots. Foreign competition isn't the main reason we're losing manufacturing jobs. Approximately 85% of the manufacturing jobs lost since the 1980's were due to advances in technology and automation. US factories are producing 2.5 times as many goods as they did in 1980, but using fewer employees to do so. In the long term, wages generally follow productivity. As such, classic economic theory suggests that this increased should result in higher wages and the factory worker of 2020 will have a better lifestyle then the factory worker of 1980. However, these higher wages for the factory workers that remain are cold comfort to workers displaced by robots. 3-D printing is set to continue the disruption and upheaval of the manufacturing industry. A recent report from Wohlers Associates estimates that 3D printing "could one day become a $640 billion market, if it captures only 5% of the $12.8 trillion manufacturing industry market share." The current shift of manufacturing towards high tech will only continue. The disruption from 3-D printing could be large enough to cause even China to lose manufacturing jobs to computers and robots. This isn't the first time technology improvements have caused significant job losses. In the year 1900, 38% of the people were farmers (USA Bureau of Labor and Statistics). Technology improvements increased farm productivity and less than 2 percent of the current USA population are directly employed in agriculture (USDA AG Census). Technology improvements are largely good, but they don't help everyone. The world is moving to renewables (we need less coal). Previous manufacturing in the US was a low skilled and low margin industry. Those jobs are gone forever. Instead of trying to live in the past, we need to focus on the future. It's not all doom and gloom. There are bright spots in American manufacturing. Companies like Synder Filtration are reinventing what it means to be an American company with a manufacturing facility in the US. The new manufacturing companies will be different then the past. They will produce a complex, highly technological product. They will employ highly skilled workers, and sell to customers all over the world. The state of California gets this and is doing something about it. The California Competes Tax Credit is a corporate state tax credit available to businesses that want to come, stay or grow in California. It is designed to help keep local companies competitive. Tax credit recipients like Synder Filtration must make a commitment on various types of investments including facility, specialized equipment, software licenses, IT infrastructure, etc. In the 1980’s, firms realized they could reduce the wages paid to workers by an order of magnitude by moving to China. This was a compelling argument that profoundly and permanently changed the fabric of manufacturing in the US. USA companies can’t compete against China by cutting labor costs. This isn’t a battle the US can win. Chinese factory workers are paid $1.80 per hour. They work 12 hour days, and generally don’t have health care. Instead of focusing on driving down wages paid to USA workers, we need to find way to make them more efficient. As the productivity of factory workers increases, the sensitivity to the profit margin to hourly wages goes down and the key advantage of Chinese factories becomes less important. Chinese factories have forced US firms to become more efficient. Factory workers in the US now produce $73.45 per hour in output. This is the key challenge that factories in the USA need to answer. As a factory owner, how can I ensure that the average productivity of my workers is over $100/hour? If we can reduce the importance of labor costs, then we minimize the advantages of Chinese firms (low labor costs). Conversely, the strengths of US firms (proximity to markets, quality ability to control quality, easier communication) will start to drive decisions. Technology is a double edged sword. Technology has created efficiencies that resulted in the layoffs of many factory workers. Conversely, these same efficiencies by increasing worker productivity, decreased the importance of low wages as a competitive advantage, and made USA manufacturing more competitive in the global marketplace. That’s a problem, says Mr. Shih, that doesn’t apply so much to larger items. “Honda this year is going to export more cars that are made in the US than it will import to the US from Japan,” says Mr. Shih. In other words, large manufacturing such as autos, airplanes or appliances should continue to do well in the US. The US has maintained its global share of manufacturing. The US had a 20% share of global manufacturing in 2009 compared to slightly over 22% in 1980. The narrative that the US has lost all its factories isn’t entirely correct. US manufacturing is changing and we need to embrace this new reality. The state of California understands this new reality and is leading the way with initiatives like the California Competes tax plan. It's tempting to blame China, trade policy, or the government for our loss of factory jobs. The reality is that manufacturing has evolved to achieve ever greater efficiency, quality, and total output. We must not only accept this fact, but embrace it. We must invest in research and development in order to compete. Above all else, we must prepare our future workforce with not only the skills they need to survive, but thrive, in this brave new world of accelerating advancements in manufacturing technology. Synder Filtration is a case in point. Synder provides nanofiltration, ultrafiltration, and microfiltration products, as well as anode cells and systems, for a variety of specialty applications worldwide.This is a complex process. Synder needs employees with science degrees, such as Chemistry, Chemical Engineering, and Mechanical Engineering, as well as operators with the skills and training needed to implement our long-term plans to pivot to automation and more advanced manufacturing techniques.Their employees are responsible for developing and producing cutting edge membrane filters for liquid process applications including industrial water and wastewater recovery, food & dairy processing, automotive coating, and biotechnology. It doesn't make sense for Synder to outsource because their margins are high, the work is complex, and quality is paramount.